Interesting project. I just downloaded the files. 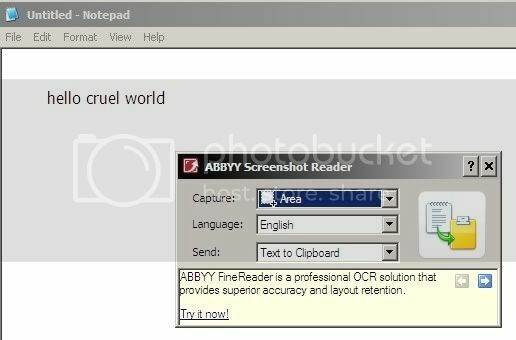 If they work I'll test them against ABBYY Screenshot Reader, which is a commercial alternative. I've also tried ScanSoft's Omnipage 16 for regular OCR, but didn't like it. Just download the latest version from http://jocr.sourcefo...t/download.html. To fix the script, open ShowOCRUnderMouse.ahk, go to line 77, and replace "gocr.exe" with "gocr047.exe" (the name of the newly downloaded gocr binary). Good to go! I've been trying to rewrite n-l-i-d's OCR demo script into a function so that I may call it only when needed, though I've run into a wall with an error that I can't seem to get rid of. 1. For the ShowOCRUnderMouse.ahk I had to replace gocr.exe with the newer gocr047.exe (but renamed to gocr.exe for obvious reasons). 2. I had lots of trouble setting up m2's Screengrab script - maybe he was using an older version of AHK with slighly different syntax. In any case, I had to remove every instance of "cmd /c" from the RunWait commands to get his Screengrab script to work. I've only tried it on notepad text, but so far I'm impressed (the result is in a text box in the lower right corner). I downloaded the full portable version of ImageMagick (ImageMagick-6.5.2-Q16-windows.zip), potrace with mkbitmap package (potrace-1.8.win32-i386.tar.gz package, and finally Windows-binary gocr047.exe (but renamed to gocr.exe). I also installed the super stable version of NetPBM from the previous link - just in case, but in hindsight I don't think it's needed or used by m2's version of gOCR. Finally, the version of tesseract I have came with Softi FreeOCR. It put tesseract.exe and tessdata folder into my Windows directory; the rest of the program resides in various Program Files and Documents and Settings folders, but I suppose m2's script doesn't need those. (i) a similar hotkey setup to the screenshot script presented in this thread: http://www.autohotke...opic.php?t=4086 (i.e. WINKEY+S to trigger script (launches screen mask) and pics up the next LeftClick down and LeftClick up to determine the box to screengrab. -please keep the project alive; it's quite impressive imo. I ended up implementing the suggestions I made in the previous post. i.e. I changed the tray icon, added the option to launch screengrab by left-clicking on the tray icon (single click), and changed the hotkey. Previously: CTRL+LeftClick to start selection and 2nd LeftClick to end selection. Now: WINKEY+Q to enable selection, LeftButton Down -> drag box -> LeftClick Up to select area for OCR. However, the selection method is a bit slower than the original one (but smoother). I left in my own paths, so if anyone tries to use this version, you'll need to change the icon path on line 4, and dependencies paths on line 17, and 23-27. Gui, Show, x0 y0 h%A_ScreenHeight% w%A_ScreenWidth%,"AutoHotkeySnapshotApp"
comment :="#File made in Autohotkey"
;MsgBox, The MainProcess subroutine has returned (it is finished). MsgBox,,Save canceled, No image saved. MsgBox The attempt to overwrite "%SelectedFile%" failed. MsgBox The attempt to remove "%TmpDir%\%TmpFile%.ppm" failed. MsgBox The attempt to remove "%TmpDir%\%TmpFile%.%ImageFormat%" failed. MsgBox The attempt to remove "%TmpDir%\%TmpFile%.txt" failed. MsgBox The attempt to remove "%TmpDir%\%TmpFile%.png" failed. ; Need to run gocr thru cmd, ??? Gui, font, s10, Verdana  ; Set 10-point Verdana. Gui, Add, Text,, The hight is %hight%, %scan_y_start% - %scan_y_end%. Gui, Add, Text,, The width is %width%, %scan_x_start% - %scan_x_end%. Gui, 2:+owner  ; Make the main window (Gui #1) the owner of the "about box" (Gui #2). Gui +Disabled  ; Disable main window. Gui, font, s12, Verdana  ; Set 10-point Verdana. Gui, 2:Add, Checkbox, vNoLineReturn checked%NoLineReturn% xs+25, Remove line returns. Gui, 2:Add, Checkbox, vInfoWindow checked%InfoWindow%, Show Info Window. Gui, 1:-Disabled  ; Re-enable the main window (must be done prior to the next step). Gui Destroy  ; Destroy the about box. Here's a rewrite of the original script. (Minus selection functionality. This way you could pass coordinates to it as a function.) I couldn't get my tesseract executable to work. Kept getting system error 1.
; Requires gocr or tesseract, mkbitmap, potrace, and imagemagick. mkbitmap = 1 ; 1, Preprocess screen grab using mkbitmap. 0, false. mkb_i = ; -i, inversion. Blank by default. mkb_n = ; -n, nofilter. Turns off highpass filtering. Blank by default. mkb_interpolation = "-1" ; "-3" or "-1". Cubic or linear interpolation. "-1" yields better results for text. mkb_g = ; -g, grey. Only scales and greymaps the image. Blank by default. potrace = 1 ; 1, Preprocess screen grab using potrace. 0, false. pot_n = ; Blank by default. "-n" turns off curve optimization. ; Needs four variables representing the points needed for the scan. ; A set of coordinates for the upper left corner of the scan area (the origin), and a set for the lower right corner of the scan area. ; Represented by scan_x_start, scan_y_start, scan_x_end, scan_y_end. CoordMode, Pixel, Screen    ; Sets pixel actions relative to coordinates of the full desktop window or the active window. Use the mode that you used to obtain the starting and ending coordinates of the image area. scan_current_x = %scan_x_start%   ; Sets the starting x point of the scan. The origin of the window is the upper left corner. scan_current_y = %scan_y_start%   ; Sets the starting y point of the scan. ; Need to turn the value returned into a hexadecimal value. ; Need to perform a math operation using the variables in order to get them in integer decimal format. ; Clean old temporary files. Else If app = "tesseract"
fwiw, the version of tesseract I have came with Softi FreeOCR. It put tesseract.exe and tessdata folder into my Windows directory; the rest of the program resides in various Program Files and Documents and Settings folders, but I suppose m2's script doesn't need those. I wrote a small print text at the bottom of one of my earlier posts with details because I had trouble finding all software needed to go with this project. Your documentation has been quite thorough and awesome ! Basically re-used Pajenn's last code and set Clipboard =%ocr_t_text%, remove gocr lines [optional]; thats it. because you don't want the Finns to get their hands on it ?? the gocr.exe file needs a dos-passable path. So for the TempDir Variable (at the top), make sure you write out the whole absolute path, because otherwise the %A_workingDir% won't cut it. The symptom is that no error messages are displayed, and pictures are popping up, but the final ocr text fields are both blank. but I can not seem to get it to work - no matter what i select it does not copy the image even to perform the OCR. Just for info i unzipped it to C:\ocr\ and updated the one line for the Temp file to c:\ocr\temp . any help would be really appreciated!!!!! Ok I got it to work, silly mistake but may be important pointer for others. After you press win+q and the screen grays out to take the snapshot, you left click drag the selection box and unleft click BUT it only works on a drag from left to right not right to left. I took some ideas and scripts and made the following, works pretty well. It needs a bit of work on the GUI side, but the capturing/OCR-ing works pretty solidly. Links to all programs needed are in the script. Please let me know what you think, this has been a lot of trial and error and I'd love other peoples' opinion as to the usage, settings and my code. This script allows a user to select a rectangle to OCR to clipboard. 6. using either Tesseract or GOCR the file is "read"
; 3d: Potrace: transform bitmaps into vector graphics. outputdebug Error`, no text was detected. CaptureScreen(Area)   ; Saves selected area without cursor in Clipboard. streets of West Oakland in the San Francisco Bay Area. that stem from the neighborhood's mixed rural Southem and Latino heritage. streets ot West Oakland in the San francisco 8ay Area. th8t stem trom lh_ neighbomood's mixed _r8l Southem 8nd __no hent8g8. updated version. Making steady progression with the GUI. StringReplace, db_gocr, db_gocr, %A_ScriptDir%, . GUI, add, checkbox, xs w%tab_width% vmkb_i section, %A_Space%-i : Invert the input image. GUI, add, checkbox, xs w%tab_width% vmkb_f gcheckedit section, %A_Space%-f : Apply a highpass filter to the image. GUI, add, checkbox, xs w%tab_width% vmkb_n section, %A_Space%-n : Turn off highpass filtering. GUI, add, checkbox, xs w%tab_width% vmkb_b gcheckedit section, %A_Space%-b : Blur the image to reduce visual noise. GUI, add, checkbox, xs w%tab_width% vmkb_s gcheckedit section, %A_Space%-s : Scale the image by an integer factor great than 0. GUI, add, checkbox, xs w%tab_width% vmkb_l section, %A_Space%-l : Use linear interpolation when scaling to a higher resolution. GUI, add, checkbox, xs w%tab_width% vmkb_g section, %A_Space%-g : Disable bilevel conversion, processing stops after the scaling step and a greymap is output. GUI, add, Text, xs w%tab_width%, `nDescription:`n`nmkbitmap reads an image and applies one or more of the following operations to it`nin this order: inversion, highpass filtering, scaling, and thresholding. Each operation can be individually controlled and turned on or off. Select backend by name, where name is one of eps, postscript, ps, pdf, pdfpage, svg, pgm, gimppath, xfig. Backend names can be abbreviated by an unambiguous prefix. Encapsulated PostScript backend (default). The input is a single bitmap; the output is a stand-alone, encapsulated PostScript file that can be included in other documents. GUI, add, checkbox, xs w%tab_width% vpot_z gcheckedit section, %A_Space%-z : Specify how to resolve ambiguities in path decomposition.`nMust be one of black, white, right, left, minority, majority, or random. Default is minority. GUI, add, checkbox, xs w%tab_width% vpot_t gcheckedit section, %A_Space%-t : Suppress speckles of up to this many pixels. GUI, add, checkbox, xs w%tab_width% vpot_a gcheckedit section, %A_Space%-a : Set the corner threshold parameter. The smaller this value, the more sharp corners will be produced. If this parameter is negative, then no smoothing will be performed and the output is a polygon. GUI, add, checkbox, xs w%tab_width% vpot_n gcheckedit section, %A_Space%-n : Turn off curve optimization. Larger values allow more consecutive Bezier curve segments to be joined together in a single segment, at the expense of accuracy. GUI, add, checkbox, xs w%tab_width% vpot_o gcheckedit section, %A_Space%-o : Set the curve optimization tolerance. Larger values allow more consecutive Bezier curve segments at the expense of accuracy. GUI, add, checkbox, xs w%tab_width% vpot_u gcheckedit section, %A_Space%-u : Set output quantization, output is rounded to 1/unit pixels. The default of 10 usually gives good results. For some of the debug modes, a value of 100 gives more accurate output. GUI, add, checkbox, xs w%tab_width% vpot_r gcheckedit section, %A_Space%-r : set the resolution (in dpi). Note that it follows that a larger value results in a smaller output image. It is possible to specify different resolutions in the x and y directions by giving an argument of the form nxn. GUI, add, Text, xs w%tab_width%, `nDescription:`n`npotrace is a utility for tracing a bitmap, which means, transforming a bitmap into a smooth, scalable image. The input is a bitmap, which means, a pixel-based image composed of the two colors black and white only. The default output is an encapsulated PostScript file (EPS). A typical use is to create EPS files from scanned data, such as company or university logos, handwritten notes, etc. The resulting image is not "jaggy" like a bitmap, but smooth. It can then be rendered at any resolution. GUI, add, checkbox, xs w%tab_width% vtess_l gcheckedit section, %A_Space%-l : Language of scanned text. 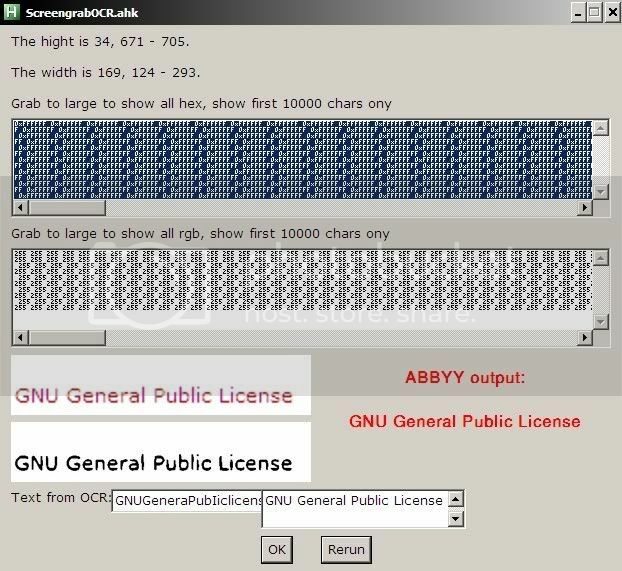 GUI, add, Text, xs w%tab_width%, `nDescription:`n`nGOCR is an OCR (Optical Character Recognition) program, developed under the GNU Public License. 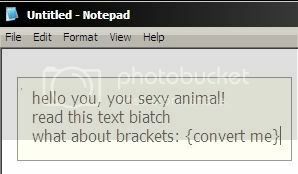 It converts scanned images of text back to text files. msgbox %App_name% - %App_version%`nby %App_author%`n`nabout text. variables = % " -" switch " "
; 3c: Potrace: transform bitmaps into vector graphics. finish_status = Error`, no text was detected.